1867: The Brownwood stage line had a horse-changing station located at an inn in Crawford. 1881: The Gulf, Colorado & Santa Fe Railway bypassed Crawford by two miles. 1890: Crawford had steam flour and corn mills, two general stores, three groceries, a cotton gin, four churches, and 400 residents; cotton, wheat, hides, and corn were the principal shipments from the area. 1880s and 1890s: The town had a series of newspapers. 1928: The Crawford Sun is published until it merges with The McGregor Mirror in 1969. The town has escaped the fires and tornadoes that have plagued other small towns. Waco being as large as it is, doesn't leave a lot of room for small towns in McLennan County. Crawford has been a trade center for western McLennan County for years - allowing its economy to remain relatively stable. The population fell to 425 in the 1950s, but commuting workers in the 1980s helped boost the population to its present 705. Crawford Located in an area of McLennan County once inhabited by Tonkawa Indians, the community of Crawford grew slowly from an 1850S settlement centered around Tonk Crossing (two miles northeast). The first townsite was at the crossroads of the Waco to Gatesville and Belton to Fort Graham trade routes. 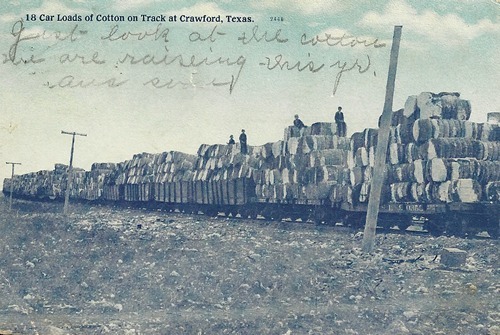 The exact source for the town's name is unknown, but possibilities include Coryell City resident William Nelson Crawford, who graded the Tonk Creek Crossing, A.C. Crawford of Galveston, a director of the Gulf, Colorado & Santa Fe Railroad, or Texas Ranger George Crawford, who was stationed here. Development increased following the Civil War, and the post office opened in 1871. By the latter part of that decade, the town included several stores, a tavern, a blacksmith shop and a school with an enrollment of about 100. In 1881, the Gulf, Colorado & Santa Fe Railroad, building north from Temple to Fort Worth, bypassed the original townsite, and residents began moving here along the new line. Crawford experienced economic growth as a result, and there were soon four churches, a cotton gin and a grain mill. Incorporated in 1897, the town remained an important agricultural center throughout the twentieth century, at times boasting more than 700 residents, two banks and dozens of local businesses. In July 1999, Texas Governor George W. Bush and his family bought the former Englebrecht Ranch (Prairie Chapel Ranch) west of town. His election as President of the United States in 2000 turned the ranch into the "Western White House," the site of gatherings for U.S. officials and foreign heads of state. Crawford gained international media attention and served as the official voting place for President Bush and First Lady Laura Bush.